The Janadesar village in the arid Marwari region of India teamed up with the Jal Bhagirathi Foundation on World Toilet Day to compete for a Guinness Book of World Records’ title. 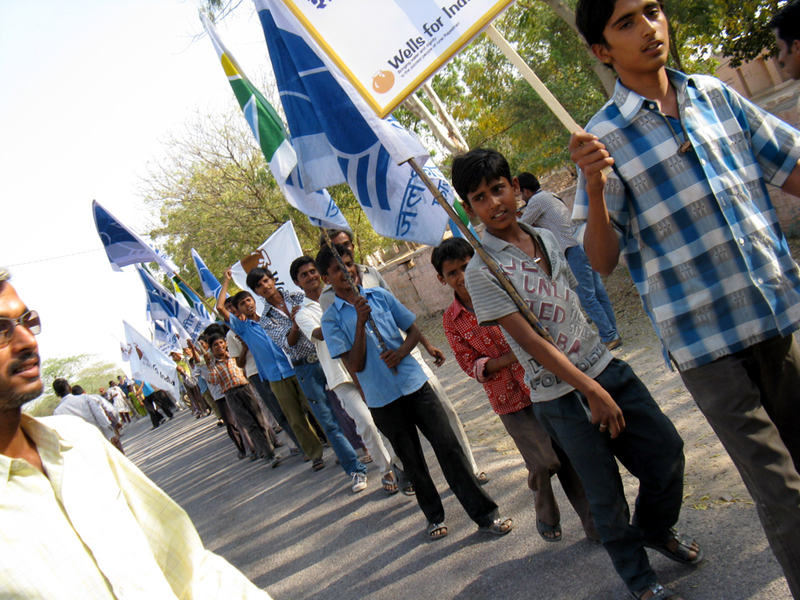 Children from Janadesar march and chant their way to the village’s newest toilet. 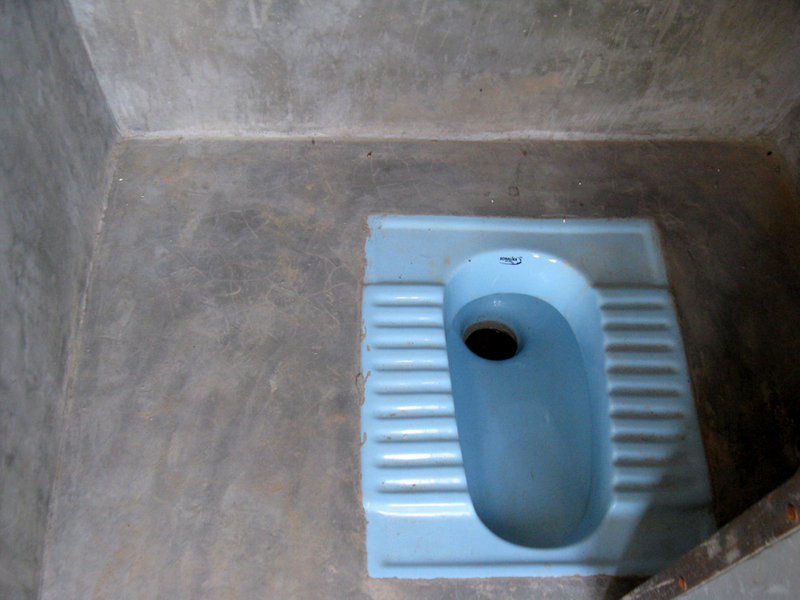 Toilet facilities added to their school have made learning better, they say. JODHPUR, INDIA – Two non-profits, mindful of India’s overwhelming problem with open-air defecation, organized an unusual event last month to attract public attention. In the water-scarce Marwari region of Northwest India, where people often relieve themselves in fields or along roads, nearly 900 residents of the rural Janadesar village marched and eventually lined up in front of their newest toilet to celebrate World Toilet Day. Instead of using the recently constructed facility, villagers chanted and held hands to form a symbolic toilet queue to raise awareness on health and sanitation issues in the area. The event was hosted by the Jal Bhagirathi Foundation, an NGO based in the state of Rajasthan, India that works on water security issues in Marwar. Roughly three-fifths of Rajasthan is covered by the Thar Desert–the world’s ninth largest subtropical desert–including part of Marwar. According to USAID figures, it is one of the most densely populated arid regions in the world, and has a diminishing groundwater resource and longer droughts. A mother and daughter who stood at the front of the line are among the first of the 845 people to sign the petition for the Guinness Book of World Records. Just one of eight people who live in rural areas of Rajasthan have access to toilets, according to a health survey by the Indian government in 2008. During the World Water Day conference in Nairobi, Kenya in March, the World Heath Organization and UNICEF released a study that found the scarcity of toilets in the developing world is a persistent problem despite a decade of global recognition. The study, Progress on Sanitation and Drinking Water: 2010 Update, revealed that while the Millennium Development Goals for access to drinking water are on target, progress has stalled with sanitation. “Among the 2.6 billion people in the world who do not use improved sanitation facilities, by far the greatest number are in Southern Asia,” according to the report. Janadesar is a departure from the norm and could be a model for how other rural and poor regions in Asia solve what is now considered the most important global sanitation problem. 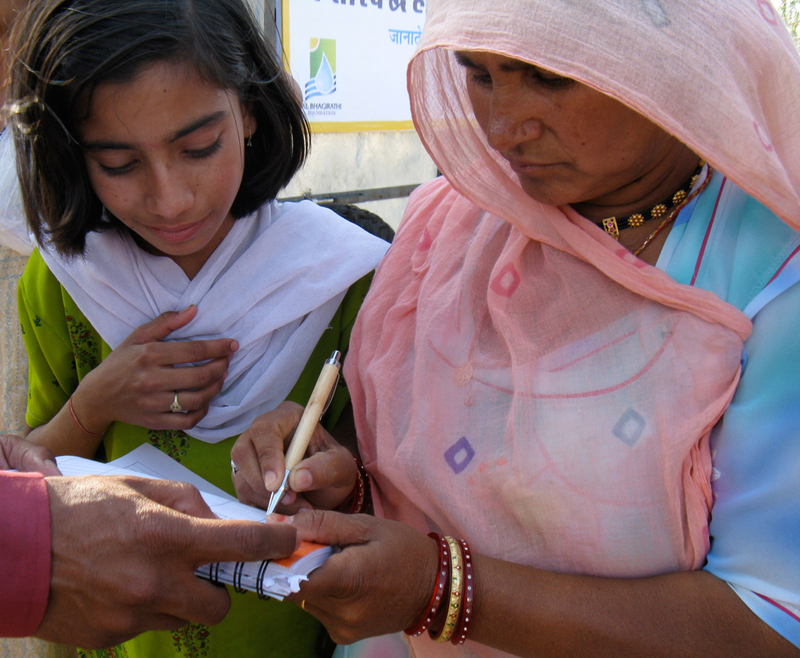 Some 80 percent of the 220 households in Janadesar meet the seven sanitation requirements established by the Jal Bhagirathi Foundation (JBF) and Wells for India, a charity based in Great Britain that works on water issues in the region. These include: the handling of drinking water, the disposal of wastewater, the disposal of human excreta, the disposal of garbage and animal excreta, home sanitation and food hygiene, personal hygiene and community sanitation. Of the 200 water-scarce villages JBF works with, Janadesar has emerged over the last several years as a pioneer in increasing access to sanitation facilities. 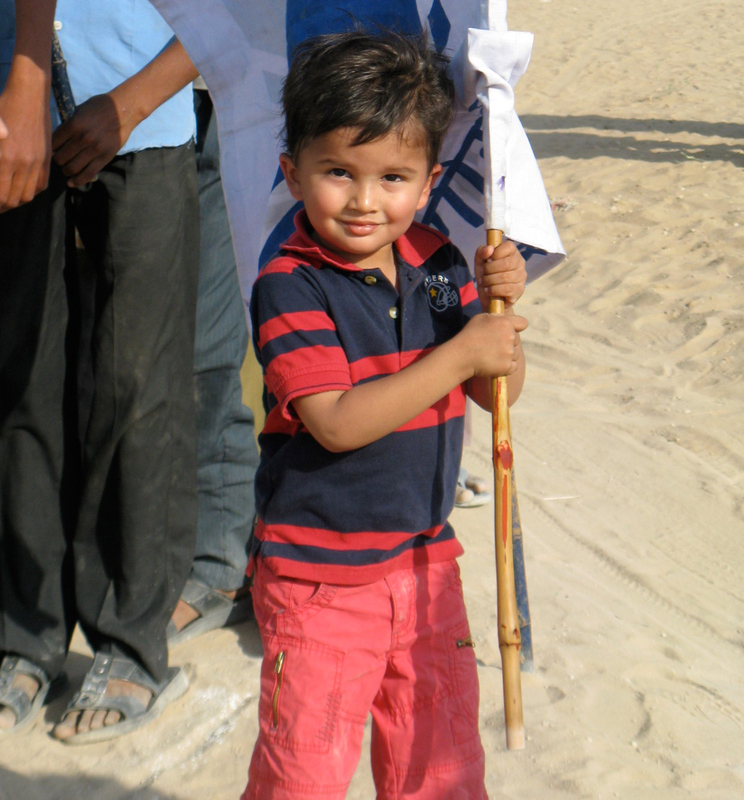 The son of the Jal Bhagirathi Foundation’s project director, Kanupriya Harish, helps lead the procession through the village to the toilet. Harish has worked on improving sanitation in Janadesar for two years. Among the 20 percent of Janadesar residents who currently do not meet sanitation standards, most are from higher castes, she added. Meanwhile the sanitation campaign has been especially empowering for women. It was a female day laborer who borrowed construction material to build the first toilet in the community. “She used to get beaten up when she went out the fields to the bathroom,” said Harish. Now with the increasing access to toilets, women can defecate at safer times and under safer conditions when they are menstruating or pregnant. Harish says the female role as change agents for sanitation in the villages was embodied in the World Toilet Day event. JBF has submitted the signatures of the 845 toilet queue participants to Guinness Book of World Records officials for review. Circle of Blue’s daily news editor Andrea Hart spent ten days shadowing the Jal Bhagirathi Foundation in India. This is the first of a series of stories based on that research. Reach Hart at andrea@circleofblue.org. An example of the interior of a toilet that has been in use in Janadesar. JBF hosted town meetings and launched an educational campaign to show villagers how to construct low-cost toilets. 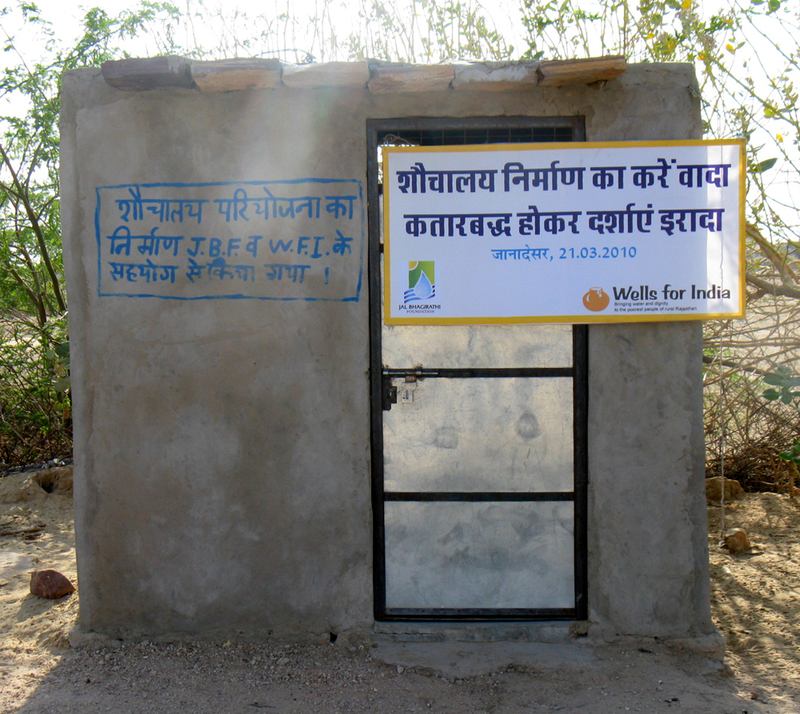 In honor of World Toilet Day, nearly 850 Janadesar villagers aligned themselves in front of this newly constructed toilet. Eighty percent of Janadesar’s households have access to a toilet, making the village a leader in sanitation issues in the region.